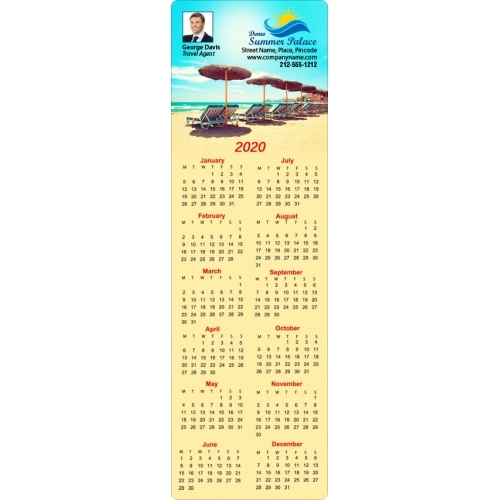 This custom 3x9.5 inch round corners beach resort calendar magnets – 25 MIL is best way to make your beach resort information stand out in crowd! Trigger the holiday mood in any onlooker with this magnet. For best benefits, you can hand out this magnet as a tradeshow giveaway or gift it prior to the start of the season or send it out as a mailer. This magnet is printed on high quality glossy paper and laminated to offer long term visibility and appeal to any information imprinted against it. Request a quote to know what you may save on bulk ordering this personalized 3x 9.5 inch round corners beach resort calendar magnets – 25 MIL. Imprint Method- Full-Color (Four Color Process) & Pantone Color Match. Price includes printing in full-color (four color process) on one side. Pantone® color matches not available in full-color. Magnets are not intended for outdoor use. Write-on/Wipe-off surface not available. Product Size : 3 in. x 9.5 in.